PLEASE complete the report form found online here http://kcactf2.flywheelsites.com/respondents/ within 2 weeks of seeing the production. You will receive an email confirmation of receipt, which you should then forward to the director and Department Chair. In the case of a student or guest director, please ask the faculty at the school who should receive the report. If it is a Participating production, please complete the written response report as well, but do not forward that to the school. Respondent is contacted by the regional chair, or circuit coordinator, about an entered production. Reply as quickly as possible either positively or negatively. Regional chair or circuit coordinator emails a copy of registration form for entered production to each respondent. Remember that a participating production is requesting consideration for an invitation to perform at the regional festival. The college expects an on-site response, a copy of the response report following the production, which includes student nominations in eligible categories. The regional chair is sent a copy of the response cover page, a brief written assessment and a program in a timely manner, but not later than 2 weeks following your response. Schools entering productions on the associate level expect an on-site response, a copy of the response report following the response and student nominations in eligible categories. A copy of the cover sheet and program is submitted to the regional chair in a timely manner. A written response for associate entries is not expected. Respondent contacts director (or designated contact) to set up response date. When contacting a director, set up a time and a place to meet. Get clear directions to the theatre/dinner/hotel. Dinner before a show, provided by the host school, is customary – it is a good time to become acquainted, discuss post-show session (procedures, issues to address/avoid), learn about context/size/type of department, production, support, etc. The cost of overnight accommodation, if necessary, is to be covered by the school. Respondent travels to see production. Respondent participates in a response session, which generally is from 45 minutes to an hour of conversation. A response session usually immediately follows the performance (although 10-15 minutes to get actors out of costume can be put to good advantage organizing notes), with the director, designers, cast and crew as the typical audience, however this can vary as some programs enjoy a broader audience base as part of their educational process. PLEASE, identify yourself as the respondent, familiarize the company with the goals of KCACTF and briefly outline opportunities this organization offers. The following outline serves as a reminder of areas to be addressed in your response (although not necessarily in this order). Choice of Play: *What is the play about? *How did this group approach the play/ make it clear? Acting: *Truth of movement, ensemble, voice, characterization, consistency. *Try to comment on as much of the cast a possible. Additional Comments: *As appropriate, such as dramaturgy, program, front of house, etc. Discuss Irene Ryan Acting Scholarship Audition nominations, with the director or faculty contact, on-site. It is customary for each respondent to nominate one performer to participate in the auditions at the regional festival; the school may nominate another. Try to coordinate with the school to maximize the number of students provided this opportunity. Discuss with the director and possibly students the Regional and National Award Opportunities for Design and Management (Set, Lighting, Sound, Costumes, Make-up and Stage Management), The O’Neill Critics Institute, Dramaturgy, Directing (SDC), Scholarship and the National Playwriting Program, and nominate those students who are best prepared for each opportunity. Please note: many of these opportunities do not require nomination and students involved in productions which receive a respondent are now eligible to apply. Discussions of all nominations should consider readiness, preparation, availability, and the relative benefit of participating at Festival. Nominations should be coordinated with the other productions from the same school to include as many students as possible in the Festival experience. Student designers should be made aware of rules and guidelines for submitting their work at the regional festival. Please make sure that they, or their faculty advisor, know how to contact the regional design chair and submit appropriate forms. And also, refer Irene Ryan nominees and/or their faculty advisors to the Irene Ryan segment of the kcactf2.org website for guidelines for selection and preparation of audition material and submission of appropriate forms. You may award certificates of merit in any area of artistic or technical expertise that you find especially noteworthy. You may recommend scenes from associate or participating entries for inclusion in the “Showcase of Invited Scenes” at regional festival. Such recommendations should be for scenes of approximately five to ten minutes in length. Recommendations must come from the respondent and must be included on the cover page in order to inform the entering school in a timely manner of their possible invitation. (Larger play segments, 1-acts and experimental work can be identified as well in consideration for the Fringe Festival). Selection of scenes will be determined at the regional selection meeting in December. Response Report forms can be found under “respondents” and should be completed as soon as possible after the response, preferably no more than one week. Please be sure to include ALL requested information on the cover page and to address categories in the brief written response for participating productions. Try to obtain all pertinent email addresses. The response report will be sent directly to the Regional Chair when you hit the submit button, and you will receive an email confirmation containing the report. Please forward that to the director (or designated faculty member) and Chair of the Department. Keep a copy of the program in case the regional chair needs to see it. Also send the written assessment in the case of participating productions. Reimbursement disbursements cannot be authorized until the response sheet is turned in and the written assessment is received for participating productions. Reimbursement forms are also on the website under “respondents” along the top menu. These guidelines discuss a series of philosophical and procedural guidelines intended to suggest approach and provide structure for assessing participating and associate KCACTF productions. Responses are not about good and bad, right and wrong. They are about integrity and respect, the integrity of the production and the company and the respect for the work and the process. The respondent agrees to watch the production on one given evening and respond to it. Whether he or she likes, hates, knows, and/or has directed the play remains irrelevant. What is relevant is the respondent’s experience n the theatre this night, with this company, as an informed member of the audience. Respectful of the work and the process: Theatre is a collaborative art, and as such implies that artists working as a unit are built around mutual respect. Artists, individuals and companies are vulnerable, especially before a respondent. We must respect and acknowledge this vulnerability without deferring to it. One person’s response, not a definitive word: Respondents can reduce initial tension by assuring the company that they are going to share their personal, professional experience of the company in one particular night, and that those experiences have validity based on experience and individual truth. To that end, respondents must respond, not pontificate to what they see, not what they expected to see. They should avoid phrases such as, “What I wanted/needed to see.” Instead, they should use, “This is what I saw” or “This is what you presented” or even the ask the question, “Is this what you wanted me to see/feel?” If “yes,” the respondent discusses the choices the company made that got them there. If “no,” the respondent and the company discuss the choices that interfered and other options. Respondents must avoid the temptation to redirect the work. Respondents develop individual methods of responding to productions depending upon their training, experience, personalities, and souls. The problem-solving method of responding has been proven successful for many respondents because it is non-threatening: respondents pose questions about the problems and traps solved in a production (or not, as the case may be). Together, with the director and company, they seek and evaluate solutions. For example, respondents may begin by considering the traps inherent in the script/theatre space; what this company did to avoid the traps; where the company stumbled; the level of choices made by the company (original? clear? effective? ); or whether the company took risks or played it safe. A respondent might detail what he or she experienced from the moment of entering the theatre through the curtain call, in a chronological methodthat is easy to facilitate by taking good notes throughout often marked by quotes, moments in the play, or visual elements. This often provides the company with a thorough and thoughtful journey through the entire play. 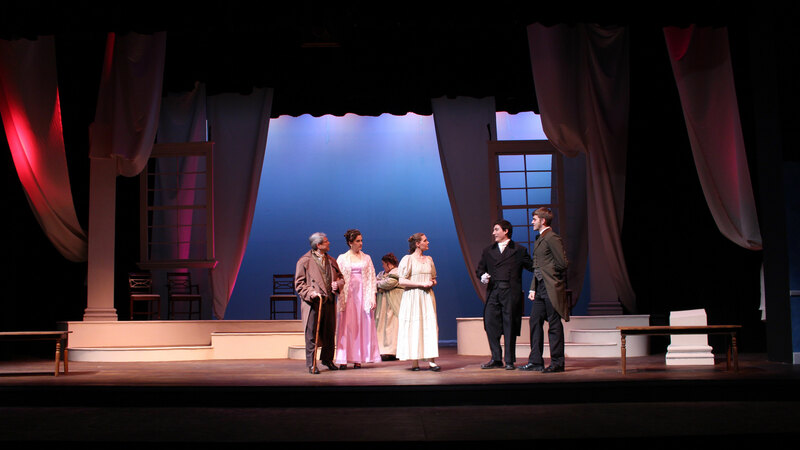 Cognizant of problems during the production: If audience members laugh inappropriately or exhibit signs of restlessness, respondents may focus on the sort of participatory response the work should evoke, including considering whether the response received is consistent with that which the playwright intended. The experience of the respondent of a production is always grounded in the company’s understanding of the script, or the company’s ability to find its truth (basic conflict, polar attitudes, major metaphors, structure, music, imagery, etc. ), and then to transfer that truth to the stage. FUN, Has a SeNsE oF HuMoR: Use your own experiences and your personality to guide you and to help you create bonds and deliver information. or prejudiced by previous performances or expectations. Truthful and Constructive Criticism: Respondents can say almost anything about a play if they are: 1) connected with and not isolated from the company; 2) perceived as truthful, sensitive, and knowledgeable; and 3) they organize effectively the information they wish to present. It’s important to begin positively and to try to reduce anxiety. Respondents should give the message that they are there to share one personal, informed view of one performance that does not take process into account. Respondents can often give tougher advice to a company with a strong production than one with a weak one. And they can often be more specific at the end of a response than at the beginning, especially if they work at first to be heard. The respondent’s job immediately is to discover what the company can and cannot hear—and when to best present information in the course of a response. The trick is to open up each company and to remove defenses and find language to make an audience receptive. Inclusive and Specific: All elements of productions are included in a response—choice of play, directing, acting, design, and execution of design—but you can do this in any order you want. Let the response or the play guide you, and by all means, you do not have to discuss each element in a vacuum. They all cross over. You DO NOT have to talk to each actor, but do not rely on the old “ensemble” fallacy, where a good ensemble means you don’t have to talk to individual actors. You make the call based on the play. Many respondents begin with directorial choices to set up environments, aesthetics, climate, and mood. Discuss specific choices, particular moments, transactions, colors, timing, textures, clocking, wigs. Share with the company choices and executions that may have been weak or questionable, and indicate why, in your opinion, a choice did not work. Ask questions. Expect specific answers. Create an atmosphere that encourages this exchange.